Fontana, California, resident Maria Modero thought she and her husband were going on a typical Sunday night date to Soboba Casino for New Year’s Day, an activity that they regularly enjoy. Soboba Casino winner Maria Modero wins a brand new Corvette. Little did Modero know, fate was in store for this romantic duo, and soon dreams were going to come true. The lucky couple would be leaving the casino that night with over $80,000 in cash and prizes. The luck began while playing on the “Heart Throb” slot machine, when Modero’s husband hit a $20,000 Progressive Jackpot. But the luck didn’t end there. Shortly after her husband was paid out for his jackpot win, a name was announced from the casino’s promotions area. 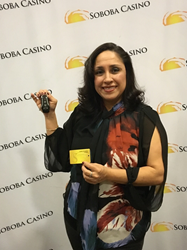 Modero had just been drawn as the grand prize winner for Soboba Casino’s “New Year’s Day Corvette Giveaway” in which the prize was a brand new 2018 Corvette Stingray. Modero's name was drawn at random from more than 5,045 entries into the drawing. “It is my husband’s dream car. I couldn’t believe it. I was thinking, what’s going to happen next? !” The romantic evening couldn’t have ended better for the lucky couple.